"As summer turns to fall, one day can be sunny and warm, and the next cool and dreary. Your sewing plans have to change with the weather. Let us help you create something that is perfect for this season of transitions. Rue offers two versions with pieces that can be easily mixed and matched to create the perfect dress. The bodice has flattering, curved style lines that start at the side seams and meet at center front. The bust tucks can be easily adjusted to fit your shape. Add piping in the curved seams for a subtle detail, or color block the side panels for an eye-catching display. 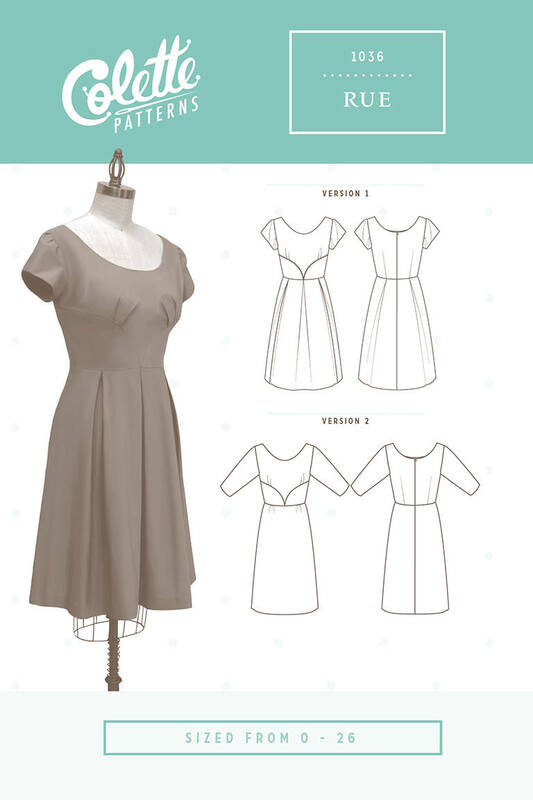 With two skirt and sleeve options to choose from, you can truly create a garment that you feel most comfortable in. In version 1, Rue is perfect for those warm autumn days at the orchard or pumpkin patch, enjoying the outdoor festivities. Sewn in a seersucker, linen, or mid-weight cotton, it will keep you comfortable in the warmer weather. For those cooler days, sew up version 2 in a lightweight wool or cotton flannel. Pair it with a cardigan, and version 2 will keep you warm as you walk the woods, admiring the changing colors of the leaves. Rue has multiple design options so your clothing is as fluid and changing as the seasons."